The use of fats and oils in food & beverage launches has increased globally, featuring a +6% year-over-year growth when comparing 2018 and 2017 launches. In 2018, the top categories of global product launches tracked with fats and oils were Bakery (24%), Snacks (14%), and Ready Meals & Side Dishes (11%), with Vegetable Oil being the leading ingredient among the ingredients tracked. The top positionings of global product launches tracked with fats and oils in 2018 were No Additives/Preservatives (16%), Gluten Free (14%), and Vegetarian (11%). The use of dairy proteins in food & beverage launches is increasing globally, featuring a +7% year-over-year growth when comparing 2018H1 and 2017H1 launches. In 2018H1, the top categories for global product launches with dairy proteins were Dairy (17%), Sports Nutrition (17%) and Bakery (12%), with Milk Protein being the leading ingredient among the ingredients tracked. The top positionings of global product launches tracked with dairy proteins in 2018H1 were Gluten Free (18%), High/Source of Protein (17%), and Sports & Recovery (17%). 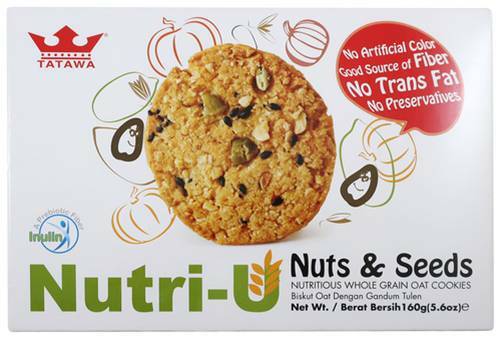 Individual packs of nutritious wholegrain oat cookies with nuts and seeds, held in a carton box. Wheat flour, vegetable shortening (palm oil, natural coloring E160a), sugars, whole meal flour, oat, malitol syrup, eggs, potato flakes, almond, pumpkin seeds, non dairy creamer (milk derivative caseinate), milk powder, maltitol syrup, inulin, cornstarch, salt, malt powder, black sesame, leavening (ammonium bicarbonate, sodium bicarbonate sodium acid pyrophosphate, calcium carbonate), soy lecithin, butter, artificial butter milk flavor..